What comes to mind when you hear the word “Antibiotics”? The media is crawling with content about antibiotics these days. For consumers – there is a growing concern about bacterial resistance to antibiotics, and sometimes these concerns are coupled with the use of antibiotics in livestock. Antibiotic resistant bacterial infections in humans are a serious concern – 2 million people become infected with bacteria that are resistant to antibiotics and at least 23,000 people die each year in the USA1. 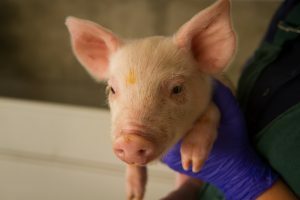 The possibility exists that the use of antibiotics in food animals may contribute to antibiotic treatment failure in humans. The Center for Disease Control (CDC) has publicly confirmed that very few of the resistant bacteria that are concerning to humans could come from food animals2. Increase veterinary oversight of antibiotic use in food animals. These changes will be effective January 1, 2017 in an effort to mandate more judicious antibiotic use. As producers, we know that when used correctly, antibiotics are of benefit to the pigs, people, and even the planet. But it takes a joined effort to use antibiotics responsibly beyond what the federal government mandates. How do we do that? First let’s cover what exactly Responsible Antibiotic Use is. At Pipestone, Antibiotic Stewardship is about providing producers the tools for Responsible Antibiotic Use to enhance animal well-being and minimize antibiotic resistance. We are here for whatever step you may need help with, whether that’s recommendations, a VFD, or even reviewing your antibiotic use data. A key tool for Antibiotic Stewardship is the ability to Record, Review, and Respond to antibiotic use data. Some producers have made the mistake of jumping to the Response step before taking the time to Record and Review the data. Just like any other part of your business, it’s important to understand the numbers before you can confidently make a good decision. Whether it’s your genetics or feed intake, you use real data to make decisions on what’s best for your herd. So why is antibiotic use and even antibiotic resistance patterns any different? Come Jan. 1st, 2017, PART (Pipestone Antibiotic Resistance Tracker) will allow producers the tools to Record, Review, and Respond to their antibiotic use. Look for more details on what all the PART offers soon. In summary, the topic of antibiotic use will not stop come Jan 1st when the VFD goes into effect. Antibiotic Use is a real concern and we are dedicated to doing our PART for Responsible Antibiotic Use and minimizing antibiotic resistance. For more information or questions, feel free to contact Dr. Carissa Odland at codland@pipevet.com or 507.825.4211.